An inventor of an innovative wearable personal shelter has won £6,500 worth of marketing materials as part of a business competition organised by fast growing Rotherham-based online printer, instantprint. Part of the Manvers-based Bluetree Group, instantprint ran the Launch Of A Lifetime competition as part of its mission to support the UK's small businesses. Lee Price won the prize after pitching his innovative Zelter Shelter - a personal shelter you can wear. The competition, aimed to accelerate the success of the winner, included free graphic design time, an iZettle reader, a Dotmailer email marketing subscription, a social media and SEO plan, as well 1 year of free legal advice and templates. James Kinsella, co-Founder of instantprint, said: "Our Launch of a Lifetime competition received hundreds of entries and after careful consideration Zelter Shelter was selected as the winner. "Helping small and micro businesses grow their business is at the heart of everything we do. Marketing materials and promotional print make up the core of our business but throughout 2017 we wanted to offer support in all areas of running a business and our Launch of a Lifetime competition is part of this. We're excited to see how the prizes can help Lee develop Zelter Shelter further throughout 2018." 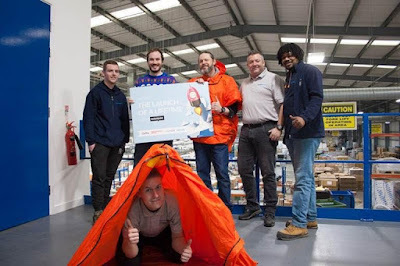 Lee Price, owner of Zelter Shelter (pictured, back row, centre), added: "We're so pleased to have been chosen as the winner of instantprint's launch of a lifetime competition. Printed marketing has been important because when you're with people it has immediacy and professionalism – a physical thing that people can see and take away with them. This is important in the places where I've been taking the product and it's a great complement to digital media. "We're focused on creating highly functional gear for outdoor safety and enjoyment. Zelter gear is durable and effective, highly portable and made for extreme situations. We're based in Sheffield and preparing to launch our first product on a large scale." instantprint started as micro-business. When childhood friends Adam Carnell and James Kinsella, graduated, they had already spotted a gap in the market for online printing. The duo founded Instantprint in 2009 using second-hand printing equipment and a borrowed office. Going from strength to strength and with turnover at around £30m, the company has been included in The Sunday Times Virgin Fast Track 100 for two consecutive years. To be included in this, companies must have an average of three year sales growth ranging between 45% and 37.5% per annum and sales ranging between £5m and £100m. Furthermore, instantprint were included in the London Stock Exchange Group's 100 Companies to Inspire Britain report, which showcases the UK's most inspiring and fastest growing companies.